Moge Friede auf Erden sein. Puisse la paix regner dans le monde. Que la paz prevalezca en la tierra. This is the message inscribed on the new Peace Pole in front of Forest Grove High School in sign language and eight additional languages: English, Spanish, German, French, Chinese, Japanese, Somalian and Tagalog. These are the languages used most commonly at FGHS. After the first Peace Pole went up in Japan decades ago, the movement spread worldwide. Now there are 200,000 poles in about 200 counties — and two in Forest Grove. 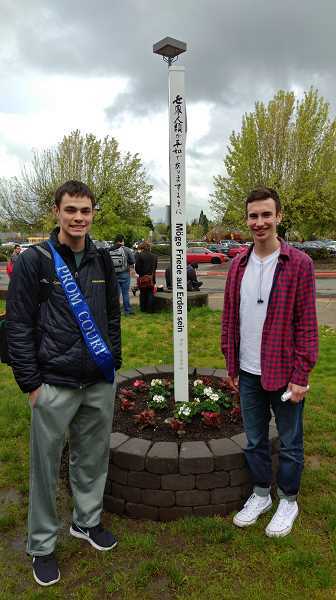 Forest Grove's first Peace Pole went up in the fall of 2016 on Pacific University's campus. 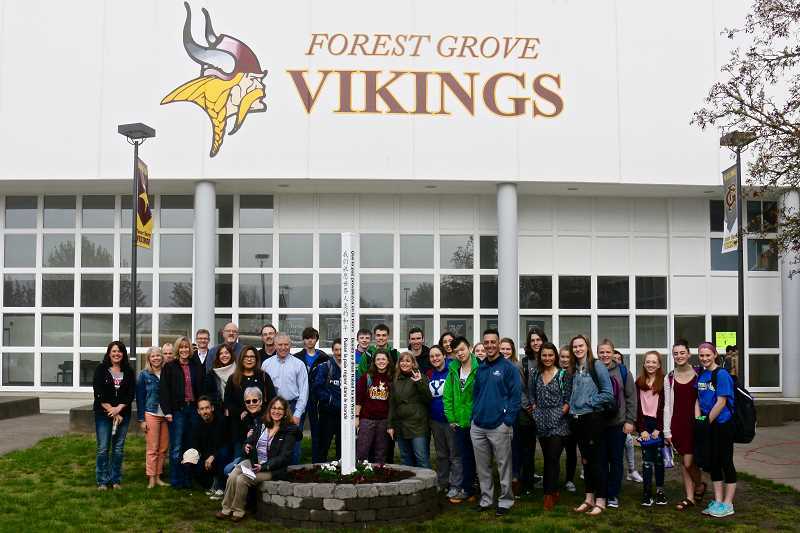 Community members, high school staff, students and Rotarians from Forest Grove's noon and daybreak clubs attended a dedication ceremony for the new pole Friday, April 21, at Forest Grove High School. Students will continue working on the project over the next year, building pathways on the grassy area surrounding the pole and beautifying what is now a muddy patch. Now that the one pole at the high school is up, Rotarian Susan Winterbourne is hoping to put one at the Forest Grove Senior & Community Center and at City Hall with the rest of her Daybreak Rotary Club members. Peace poles are "conversation starters for how people can contribute to making peace happen," said Winterbourne, a Cornelius resident. "That's what I want to see." Installment of the first pole went smoothly, said Winterbourne, and working with the students and FGHS Principal Karen O'Neill was a delight. The Peace Pole Project staff made the pole while local Rotary clubs and Portland's Jubitz Family Foundation split the cost. "I think it's a good thing to unify our school," said senior Mitchell Faris. "This year especially the school is trying to bring people together." FGHS staff have been holding workshops and classes targeted at fostering understanding and acceptance of other people. "We have a really diverse student body and I think the pole presents a good representation of our school," said junior Kyle Thompson. "It can't fix lots of problems but people can look at and it will be visual reassurance that they are welcome here."